Trousers by BASLER: smart, high-quality, low-crease and super-stretchy! 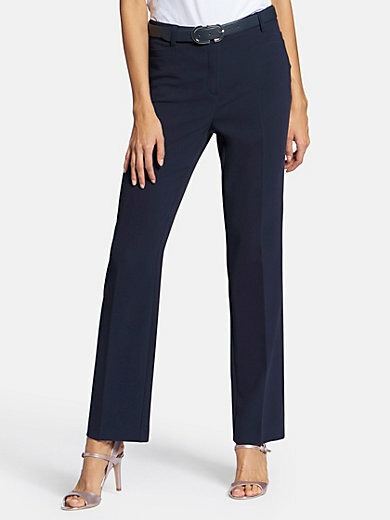 Wonderful trousers made of 63% polyester, 32% viscose, 5% elastane. Timeless cut with an excellent fit, shaped waistband, belt loops, 2 pockets on the front, 2 mock piped pockets at the back and permanent crease. Belt not included. Inside leg length approx. 32ins. Ankle width approx. 16ins. The trousers are machine washable.